It's a dark and gloomy day here. For some reason, it feels like a giveaway day. 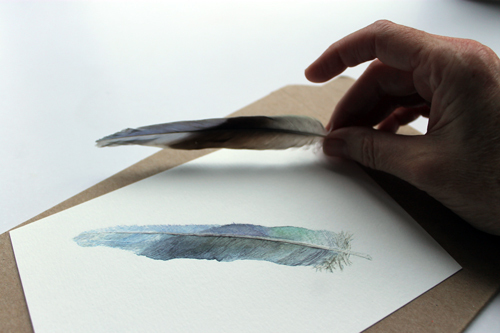 :) Leave a comment here and I will choose one name on Tuesday morning to win one of my new Blue Feather prints. There are more photos and details about the print here. 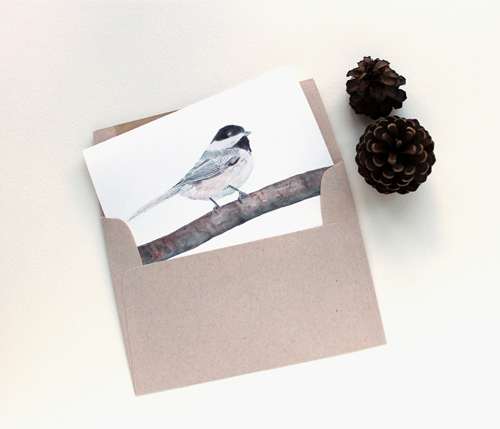 And because it is so very dark and gloomy, I'm going to add one of my new Chickadee note cards that are printed on real watercolour paper. So the winner will receive one print and one note card (with envelope). Anyone can enter. Good luck! Thanks everyone for the lovely comments. I appreciate your kind words so much. I will continue to accept comments up until 9:00 a.m. (EDT) on Tuesday, October 2nd. I'll announce the winner sometime during the morning. LOVE them both!!! I too am happiest in the garden or in my studio!! Enjoy your dark and gloomy day! I love your stuff Kathleen. Not only are you a talented painter but a very competent photographer too! love love ur work!!!!! !they r very neat! would love to win ur print! What a sweet giveaway Kathleen. I would love to win!!!!! Pick me! Pick me! :-) Thank you for being so generous with your beautiful art. A wonderful give-away! I love your work, so clean & pure. Oh, isn't that a nice way to start October ? Thank you for your generosity & kindness ! I'm adding my name in the hat ! Happy October & happy new week to you & yours ! Your paintings are always so lovely! Watercolor is such a pretty medium to work with, and it's perfect for little birds! Beautiful pieces Kathleen, anyone who wins will treasure them I'm sure. Comments are now closed. Thanks so much everyone. I'll announce the winner later this morning.